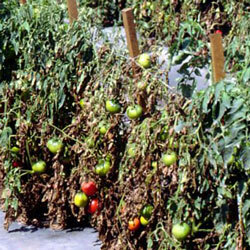 Fusarium crown rot disease in tomatoes causes the leaves to turn brown or black and eventually wilt. Early symptoms caused by crown rot in tomato seedlings include stunting, yellowing, and premature loss of cotyledons (first sprout) and lower leaves. Late symptoms include a brown lesion surrounding the stem next to the roots, root rot, wilting, and dying plants. 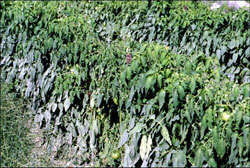 During the growing season, lower leaves turn yellow and wilt.